The campaign by a group of members of Kent County Cricket Club to persuade the County to rethink their 2010 membership structure and subscriptions is gaining momentum. Helped by the running of stories in the national media, including in today’s Times, the campaign is well on its way to gaining the 100 signatures it needs to call for a Special General Meeting of the county to discuss the matter. The campaign was launched shortly after Kent’s current membership received details of the County’s proposals for 2010. In 2009 you could be a member of Kent for £128 (£115 if you were over 65). For 2010 this was to be increased to £200 with no senior discount at all. An increase of 56% or of 74% for seniors. Various categories of membership were to be abolished including that of Country member, Senior (Over 65) and Student (18-23 for full time students). Within days of the protests starting Kent relented on the Country member category and re-introduced it at a 50% discount but at the time of writing the other categories remain abolished and the minimum membership cost for ordinary members is still £200. The outcry has come particularly from members who, for various reasons, can only attend a few matches each season but value their membership and the right to wear the county tie and sit in the members areas at the grounds when they do attend matches. Many of these members are not interested in Twenty20 so the inclusion of these games in the new package is of little value to them. The opposition is understandably strong from older members who have seen the greatest increase and it is often the case the these members find it difficult to attend more than a few matches each years - and also that they are not amongst the most enthusiastic supporters of Twenty20. Many pensioner members struggle on fixed incomes and the extra £85 they are being asked to pay is unaffordable. This means that many long-standing members will simply drift away from the county and that their membership subscriptions will be lost entirely. The result is that the income generated from the sale of membership may even decrease despite the swinging subscription increase. The campaign has opened a dialogue with the club on this matter and it is hoped that Kent will rethink their whole 2010 membership offer and avoid the cost of having to arrange a Special General Meeting. The introduction of a “tiered” membership structure similar in principle to that of Sussex seems the likely way forward. It has now been confirmed that David Davies has recommended that The Ashes should be shown on terrestrial television as a “crown jewels” event and everyone involved with English cricket should welcome the news. They won’t of course – expect a strong anti reaction from the England and Wales Cricket Board (ECB) who will their future income streams being under threat. But in fact the news is just the shot in the arm that English cricket needs and not only the fans should celebrate. Because it should prompt a root and branch review of the finances and governance of cricket in Britain so that a fit-for-purpose domestic structure is established along with a far greater spectator/viewer imperative than currently exists. The ordinary cricket fan has been the principal casualty of the disproportionately commercial bias of the ECB in recent years. Ticket prices for international matches are by some margin the most expensive in the world and with the only alternative for the fan requiring a satellite or cable subscription, which may cannot afford, cricket has slipped in the public interest compared with that glorious summer of 2005. 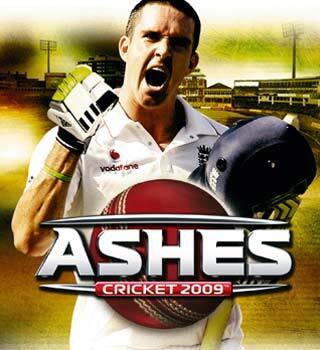 That year, of course, The Ashes were on free-to-air Channel 4 and the viewing figures were huge. This year, although the cricket was almost as enticing as in 2005, the viewers were hardly surprisingly far fewer in number. Why does the ECB seek to market its valuable international cricket properties to the highest bidders disregarding, in the process, the needs of the ordinary cricket fan? The answer, of course, rests not with the drive for income per se but with the grossly overblown expenditure that the ECB indulges in. 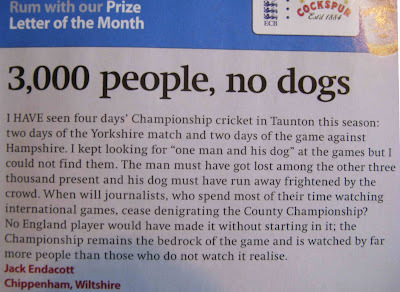 This brings us, inevitably, to the subject of the structure of domestic cricket in England and Wales. The only way that an 18 county domestic structure can exist (just!) is if its costs are subvented by handouts from the ECB. These handouts amount to around £2million per year per county and we all know what the counties do with a significant proportion of that money and who the eventual beneficiaries are – and that they are not qualified to play for England! It may seem slightly perverse to argue that the likely reduction in ECB income that the Davies recommendations will mean is actually good for the game. But if, as is likely, it forces the whole basis of the financing and operations of the ECB to be reviewed then only good can come out of it. And the start point for all this should be the ordinary cricket fan who wants affordable international cricket and, I would suggest, a far higher standard top-tier domestic cricket structure. A structure that is above all a developing ground for players who have the ability to get through to the international team and who are given the opportunity to do so in domestic competitions which are not primarily, as at present, nice little earners for itinerant cricket mercenaries! The ECB still cagey about it's "staging agreements"
Cricket lovers will be aware that the playing field for the allocation of major international matches to England and Wales cricket grounds is far from level. The ECB’s Major Match Group, chaired by Lord Morris of Handsworth, has confirmed that an Ashes Test match will take place at The Oval in 2013 as a part of their “long term staging agreement” - and Yorkshire also has such an agreement with the ECB which guarantees international cricket at Headingley until at least 2019. It is not known whether any other grounds have similar long term deals with the ECB and the ECB won’t tell! An ECB media spokesman told me “You would need to contact the individual venues. We don't release this type of information” – quite why this should be is not clear. What have they got to hide? The Oval and Headingley’s advantageous arrangements are no doubt linked to their ground redevelopment plans which needed to be underpinned financially by guaranteed international cricket at the venues. This of course brings us to Lord’s which as it stands may not even get an Ashes Test match in 2013 (although one has been promised for 2016). Lord’s has ambitious plans for its redevelopment including taking the capacity up to approaching 40,000. But these plans can surely not go ahead unless the MCC has some certainty about the long term future of international matches at the ground. MCC members and the general cricket-loving public alike will be wondering whether the ECB and the MCC can do a deal which will allow Lord’s plans to proceed. And visiting sides will also, I’m sure, be hoping for a successful outcome – how many players from around the cricket world would happily forgo a Lord’s Test match in favour of the Rose Bowl, the Riverside or Sophia Gardens! I wonder how many of those who watched the Haye versus Valuev fight yesterday remember the opening ceremony of the Atlanta Olympics in 1996 when the shambling figure of Muhammed Ali struggled nobly to light the Olympic flame. In Atlanta, and since, Muhammed Ali’s suffering from “Pugilistic Parkinson’s syndrome” was visible for all to see. Like other great champions before him – Jack Dempsey, Joe Louis and Floyd Patterson amongst many others – the effects of repeated blows to the head over years in the ring was finally taking its toll. It would be churlish to deny David Haye his moment in the spotlight and no doubt he will now climb aboard the gravy train big time before he throws in the toel for good. But will it by then be too late? It may take up to fifteen years for the damage of repeated concussion to emerge in the way that it has with Ali and countless others. Defenders of boxing often argue that many other sports are dangerous and that that the death or serious injury rate in the sport is lower than in (say) mountaineering or sky diving. This argument misses the point completely. It is only in boxing where you will have your head pummelled continuously for more than thirty minutes by an opponent whose primary purpose is to knock you senseless. That is the point of the sport – to strive sufficiently to injure your opponent that you beat him physically into submission. The world of professional boxing is an anachronism in modern sport in that attacks by one fighter on the head of another are a normal part of the tactics - and it is this aspect of the sport that is its biggest source of controversy and shame. Whilst contests in many contact sports (like Rugby, for example) can be tough and very physically and mentally demanding there is no legal sport, other than professional boxing, where the primary intention is to put your opponent in a comatose state. Boxing legitimises and glorifies violence. There is a glamour, of sorts, in boxing of course but a pretty vulgar one with “A list” celebrities occupying the ringside seats only intensifying the repulsion that many of us feel that modern society still tolerates this vulgarity. Estimates indicate that around 900 people have died from boxing related injuries over the past seventy years or so – it is, therefore, no surprise that all medical authorities have called for the sport to be banned. The American Medical Association puts the case very clearly “All forms of boxing are a public demonstration of interpersonal violence which is unique among sporting activities. Victory is obtained by inflicting on the opponent such a measure of physical injury that the opponent is unable to continue, or which at least can be seen to be significantly greater than is received in return. This particularly applies to professional boxing”. But it is the individual cases that really bring the barbarity into sharp relief. Take, for example, that of the former world Middleweight champion, Gerald McClellan, who sustained a brain injury in a fight in 1995 as a consequence of which he is now deaf, blind and confined to a wheelchair for the rest of his life. Yes such things could happen accidentally in other sports – but in boxing, as the AMA rightly says, the causing of such injury is deliberate. 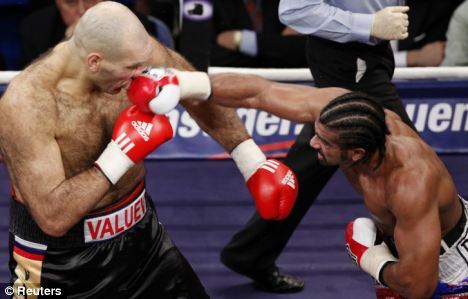 There are multi-million dollar purses in boxing at the top and nobody can blame David Haye and others for reaching for them. 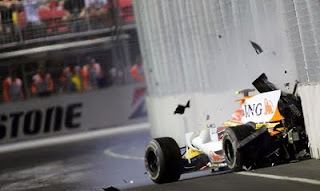 With money at this level is it surprising that the sport survives, despite all the medical evidence against it? And is it surprising that it is the sport with historically more corruption and criminality in it than any other? The history of professional boxing is littered with the debris of fixed fights, dysfunctional and greedy promoters and crime syndicates. Surely sport should not be part of this shady world at all. Sport should set an example to society not reflect back its darker images. The charter of the Olympic Games says that “The goal of Olympism is to place sport at the service of the harmonious development of man, with a view to promoting a peaceful society concerned with the preservation of human dignity.” Boxing fails this test. 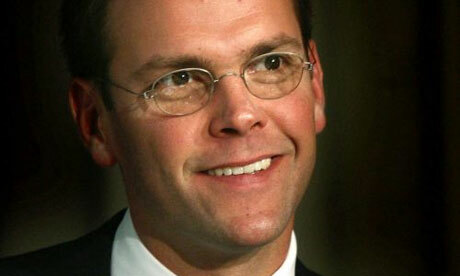 James Murdoch’s recent attack on the BBC will have surprised nobody – anyone who dares to inhibit News International’s ability to make money (and the BBC certainly does that) can expect to be in the firing line. Viewers and listeners (and we must now included surfers) of the Beeb’s output get astonishing value for money and whilst it is part of the national character to diminish our establishment, including the BBC, would any of us really hand broadcasting over completely to the likes of Sky? Which brings us to cricket. On the final day of the Oval Test match in 2005 Channel 4’s free to air coverage got 8.4 million viewers – and that on a working Monday. This year Sky’s subscription only satellite and cable transmission was watched by 1.92 million fans – and on a Sunday to boot. Whilst cost was not the only factor in play it was obviously by far the most important. At the ICC’s celebratory two day centenary conference in Oxford last month the generally genial tone of the proceedings was only upset at one point. The distinguished and candid Australian cricket writer and journalist Gideon Haigh was chairing a panel which was discussing the role of the media in cricket. Haigh made the point that the move away from free to air live international cricket in Britain meant that the millions of serendipitous viewers – the ones who are not a died in the wool cricket fans but just occasional dippers into cricket if it is of interest – would not be able to do that this year unless they had a Sky Sports subscription. The figures above prove that Haigh was right - literally millions of potential viewers could not see the coverage. Haigh’s point was that if it is part of the England and Wales Cricket Board’s (ECB) mission to widen the appeal of cricket in Britain (it is) then not to have free-to-air access to live cricket is a funny way to go about it. When Gideon Haigh had made his point he was shouted at by a voice from the back of the room where none other than ECB Chairman Giles Clarke began an uninvited harangue. Clarke’s rant was mainly directed at the BBC and their alleged failure to bid when the television contract came on offer. It was an unpleasant moment which Haigh handled will skill and Clarke eventually shut up – but his bias in favour of Sky and against the national broadcaster was clear to all present. This summer News International’s flagship British newspaper, The Times, has been the “Official newspaper of England Cricket” – quite what this means other than that spectators at the Test match grounds receive a free copy and that the ECB’s link with the newspaper is advertised I’m not sure - presumably The Times pays for the privilege. If so it does suggest that the cosy relationship between the ECB and Sky applies also to other media owned by News International. He who pays the piper calls the tune and whilst I would not wish to imply that independent-minded writers and broadcasters in the Murdoch stable like Mike Atherton, Simon Barnes, Nasser Hussain and Christopher Martin-Jenkins would ever kow-tow to the ECB party line they are also unlikely to cut off the hand that feeds them. The ECB is the piper and its paymaster is substantially the “Dirty Digger” and his empire – witness the nine limited overs matches between England and Australia which are to take place in the coming weeks all, of course, covered live on Sky. If sporting considerations were paramount rather than television income rights then would there really be quite so many one day matches? Of course not. Mike Selvey is right – there are too many vested interests and these interests, the counties and the News International media especially, conspire together with the ECB to ensure that the real structural changes that English cricket has needed for so long will be very difficult to achieve. And the one downside of the splendid Ashes win is that it might allow Giles Clarke and his cohorts at the ECB and in the counties to argue that all is well in their kingdom. It’s time for a proper review of the whole fabric of English cricket and for the ECB at the top to acknowledge that everything they do must be subservient not to their media paymasters’ wishes nor to their eighteen county electorate – but to the overriding need to have a successful England team, not just one that has a few fleetingly happy moments. Would you Adam and Eve it? You wait a couple of decades for a home Ashes series victory – and then two come along in succession! The disparity between the individual talents of the two teams seemed wide - Australia were by some margin the stronger and arguably only Strauss, Broad and Swann (for Watson, Johnson and Hauritz) would have got in the Aussie squad at The Oval. But when it came to the crunch England was, say it softly and out of Punter’s earshot, better led. Was it Napoleon or Montgomery who when choosing a General asked “Is he lucky?” – probably both. Well the luck did seem to go Andrew Strauss’s way at crucial moments but this was not a series win where chance played a disproportionate role. The two Andys, Flower and Strauss, gelled as a team and their bouncebackability was as much cerebral as it was inspirational. And despite the best efforts of the ECB to fire everyone up with phoney chauvinism England’s coach and captain quietly moulded a good team without needing to resort to flag-waving or clarion calls to arms. If Flower and his players were lions led by donkeys they were lions nonetheless and the triumph was all theirs. The final day at The Oval was full of real imagery on the field of play which will stay hard burnt on the memories of all who saw it. The extraordinary sight of Ricky Ponting, bloody but unbowed, with visible stitches on both lips and with bruises to match was genuinely moving - for Freddie Flintoff to execute a run out of the Aussie Captain was almost a coup de grace. England’s celebrations whilst understandably wild did not ignore their worthy opponents and Strauss paid Ponting and his team a very proper tribute at the end of the match - Ponting was similarly gracious. Over the course of the series the Australian coach Tim Nielsen and his captain made some puzzling calls culminating in the bizarre decision to go into The Oval Test match without Nathan Hauritz. I also think that they were unwise to jettison Philip Hughes so early in the series and well though Shane Watson played he was never likely to be a game changer – which Hughes could well have been. England overcame injuries to key players, the loss of form of most of their batsmen and a defeat at Headingley which would have taken the stuffing out of most previous England teams to bounce back with determination and style at The Oval. 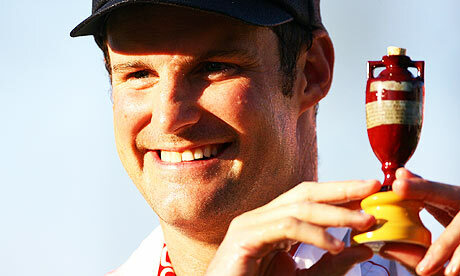 No praise can be too high for Bell, Trott, Swann and Broad who were the major contributors to England’s Oval victory. But it was Strauss who really set it up by his determined batting (130 runs off 292 balls and nearly six hours at the crease) and above all by his leadership. There are two huge challenges remaining for Andrew Strauss – to retain The Ashes in Australia in 2010/11 and then to take England to a Cricket World Cup victory in 2011. Don’t write off his chances of doing both; he’s unlikely to be distracted by IPL dollars remember! The England and Wales Cricket Board’s extraordinary capacity for getting in wrong, and for vulgarity, was on view yesterday afternoon and with characteristically crass timing. Stuart Broad had just had the session of his life, Australia were on their knees at 133-8 and the crowd was buzzing. We were all chatting and supping and clapping and cheering – not necessarily in that order - when from nowhere a singer with a microphone appeared at the Vauxhall end. When I say “singer” in fact he was (allegedly) from the Royal Opera House to which grand institution I fervently hope he has now returned. The last thing we need was an attempt to get us to sing along to Land of Hope and Glory – we’d just seen a smidgeon of glory from young Broad anyway and we were well full of hope it goes without saying. The crowd, to their credit, did not hurl fruit at the hapless Tenor but just carried on as if he was not there. Nobody joined in and he slunk away – not his fault of course; some halfwit at the ECB thought that it was a good idea. Hmmm! This series has been characterised by attempts by the England cricket authorities to hype it up. Draw a veil over Cardiff – although the singer in the silver suit will surely live in infamy as the worst performer ever to appear at Sophia Gardens. But the one sided nature of the official flag waving is improper in the extreme. At the beginning of play we have had a row of kids waving the flag of St George to greet the players – and opposite them another row of kids… waving the flag of St George. And around the ground it is the same, not an Aussie flag in sight. And before play the big screen has shown a grossly over-the-top video designed (one assumes) to fire up the patriotic fervour of the crowd. Message one to the ECB; when it’s The Ashes we don’t need firing up. Message two to the ECB; the more extreme your jingoism the more it might just fire up the other side to stuff you. Especially if they are from Down Under. Driving home after the Twenty20 Finals day at Edgbaston yesterday it occurred to me that, paradoxically, this was the longest day I have ever spent at a cricket match. I write chronologically not metaphorically – the allegorical “longest day” will always be day five at the Adelaide Test in 2006 – an experience regrettably never to be forgotten (or forgiven). But back to Edgbaston. From 11:30am to around 10:00pm there was some entertaining cricket on display – mostly not of the highest class but enjoyable nevertheless. The crown seemed strangely subdued and the attempts to hype the day up with a “Wild West” theme, curious pyrotechnics and the rest fell rather flat. The IPL it was not! But no matter there was much to enjoy – and much food for thought as well. The enjoyment first. How splendid to see Marcus Trescothick in such wonderful form. In his two innings he scored a total of 89 runs off only 47 balls and he hardly played a false shot. It was interesting to compare Tres with Luke Wright who superficially has some of Trescothick’s talent – he certainly shares Tres’s confidence at the crease. Wright scored 38 runs off 33 balls but his timing and placement was often awry whereas Trescothick’s was sublime. I like Wright – he has an engaging competitive spirit and plenty of talent. But he is no Trescothick – but then who is? There were also good and patient (by Twenty20 standards) innings from Sussex’s Goodwin and Kent’s Stevens in the semi finals the former in a winning and the latter in a losing cause. Kent lost because they crossed the line from thoughtful aggression in the Power Play overs (which would have been good) to reckless violence (which was not). Rob Key set the tone with his supercilious taking of three paces down the wicket to Willoughby - which on one occasion caused the bowler to pull out of a delivery. This was mindless and rather unpleasant stuff from Key who you may recall was being touted by some as a potential England limited overs Captain earlier this year. Not on this showing he isn’t. Also enjoyable was the terrific teamwork of the Sussex side who were worthy winners and the sight of two twenty-one year old English leg-break bowlers, Beer of Sussex and Waller of Somerset. I am glad they got their chances on the big stage of a Twenty20 finals day and they looked very promising indeed – let’s hope they continue to get the opportunities to develop their skills in the big league. Not a bad line-up you might think – rather stronger in its bowling than its batting but plenty of all-round talent there – and everyone a South African! Somerset and Northamptonshire led the way with no fewer than six non-England qualified players in their line-ups. Kent had four and Sussex three. It was especially pleasing that Sussex won because not only did they have the least number of mercenaries in their side they also had six young (under 30) England qualified players as well. Well done them. Where are England's young batsmen ? Apparently England’s middle order on the evidence of the Headingley debacle ain’t much cop so we need to change it and bring in new batting talent at The Oval. And, it would seem, the cupboard is so bare that we need to consider that excellent “prospect” (c 1990) Mark Ramprakash or the roly-poly promising ex-tyro (c 2001) Rob Key. There is young Trott (a stripling of 28) to throw into the pot and he has the benefit of never having failed at Test cricket – unlike the other two. He hasn’t played Test cricket either – but give him time. Let’s roll back the years to 1956 – a randomly chosen point in time when the Australians were also around. In that year England’s top order (1-6) included from time to time Peter Richardson, Cowdrey, Graveney, May, Compton, Watson, Sheppard, Washbrook and Trevor Bailey. Not a bad bunch to perm from in the event of injuries – which is what happened. England retained The Ashes reasonably comfortably and all of these batsmen played their part. But what if these batsmen had all suffered a collective touch of the “Boparas” (a bit like the yips in golf but with more sledging). What talent could the England selectors have called upon in extremis? Well there were a few decent batters around in the counties – Brookes, Insole, Wharton, Kenyon, Horton, Mickey Stewart, Parks, Leary, Milton and others – and there were a few promising youngsters at the Universities as well- like MJK Smith, Eagar and Walton at Oxford and Dexter and James at Cambridge. True Washbrook was recalled at the age of 41 which suggests a Ramps-type moment by the selectors (of whom he was one) – but in truth there was no shortage of batting talent all over England in those halcyon days. So what of the scene in 2009? I have put on my anorak and delved deeply into Wisden and can reveal the state of English batsmanship circa 2008. Please bear with me for some data. 369 players batted in the first-class County Championship last year of whom 96 (26%) were foreigners and not qualified to play for England. A further 94 of the England qualified players were 30 years old or more and most of these had either had their chance or were patently never going to be good enough to get a Test opportunity. This leaves us with 179 players under 30 and England eligble. 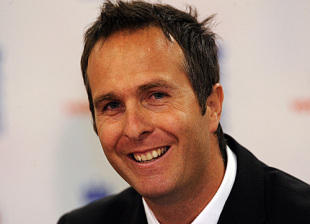 If we exclude the bowlers and any batsmen who averaged less than 40 in the Championship we are left with the following 22 players who might be considered good enough and young enough to be termed a “prospect”: Clare (Derbyshire), Smith (Durham), Bopara, Foster and Maunders (Essex), Snell (Gloucestershire), Brown (Hampshire), Horton (Lancashire), Cobb (Leicestershire), Morgan and Scott (Middlesex), White, O’Brien and Peters (Northamptonshire), Patel (Nottinghamshire), Trego (Somerset), Newman (Surrey), Prior (Sussex), Bell, Trott and Ambrose (Warwickshire), Moore (Worcestershire) . 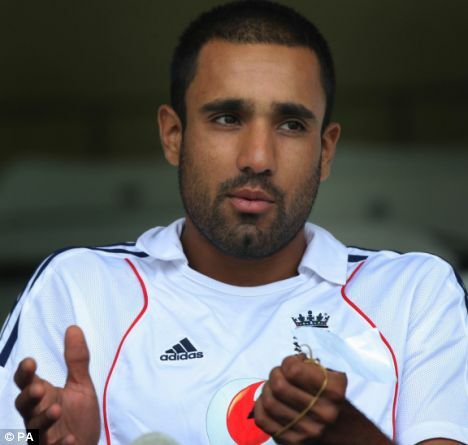 If we exclude Bopara, Foster, Prior, Bell and Ambrose (who we know about because they have already played Test cricket) that leaves us with just young 17 batsmen who might possibly be potential Test cricketers – less than one per First class county! The counties differ widely in the extent of their reliance on overseas players in their batting line ups. Top of the list is county champions Durham for whom 54.4% of their runs last year were scored by non-England qualified players. Next are Kent (46%) and Derby (40.2%). The counties which eschewed mercenary batsmen were Worcestershire (just 1.6%), Warwickshire (4.5%) and Glamorgan (5.7%). As far as reliance on the old lags is concerned top of the list were Surrey for whom 57% of their runs were scored by players over 30 like Ramprakash, Butcher and Afzaal. Middlesex also had a bit of a Dad’s Army – more than half their runs were scored by players like Nash, Strauss, Udal, Shah and Joyce all the wrong side of 30. Of course if you have batsmen in your team who are not going to play for England because of non-qualification or a mixture of age and limited ability they block off places for developing young talent. The Counties which had the highest percentage of their runs scored by English players under 30 were Essex (an admirable 66%), Sussex (60.5%) Hampshire (59.4%) and Glamorgan (55.2%). Those countries who most restricted opportunities for young players either by employing overseas players and/or by sticking with aging professionals were Kent (just 23.1%), Surrey (24.8%) and Somerset (26.1%). The seventeen players mentioned above are not household names but the circumstantial evidence from 2008 is that they just may be good enough as well as young enough to be considered for England. But the rest of the hundreds of players in the counties, players whose employment is substantially underwritten by grants to the counties from the England and Wales Cricket Board, are either bowlers or if they are batsmen they don’t come into the frame for selection. A very sorry state of affairs indeed! By early summer 2009 Kevin Pietersen has played 52 Test matches in just four years scoring some 4500 runs at an average of around 50. 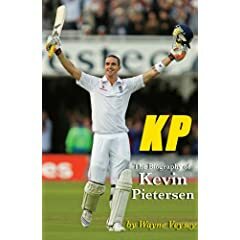 Whilst for KP to cash in with an “autobiography” in 2006 after just a year in the game was premature for there to be a provisional biography now is perhaps not unreasonable. Except that “KP Cricket Genius” is a “cash-in” as well – clearly timed to appear before the 2009 Ashes series and also to attract buyers whilst the KP England captaincy affair is till fresh in the mind. One day, no doubt, someone will write an in-depth and thoughtful analysis of the phenomenon that is Kevin Pietersen. Wayne Veysey’s ill-written, woefully edited, cliché-ridden little book certainly isn’t that. 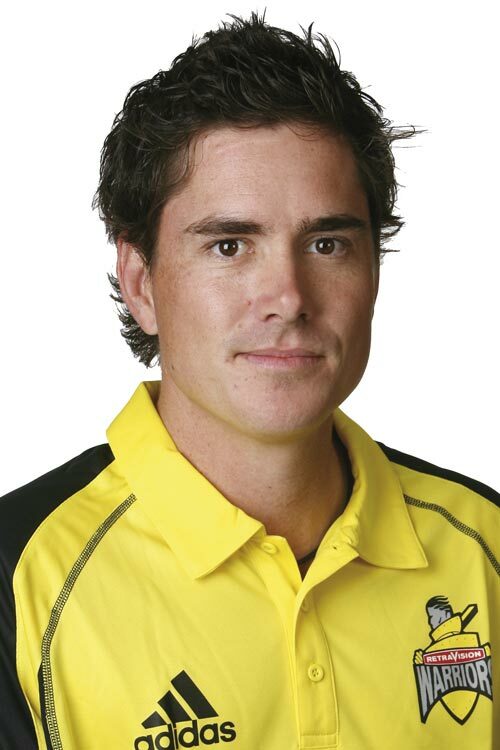 Full of typos, gratuitous factoids, hero-worshipping hyperbole, needless insults and wearying repetitions the book may appeal to the semi-literate KP fan – but cricket enthusiasts looking for real insights into Pietersen will have to wait. The book could be required reading on a sub-editing training course – as an example of what can happen if editors are slipshod. Sensitive readers will be shaken by the frequent use of the abbreviation “X1” for a cricket eleven instead of “XI”, by the occasional use of the term “cricket player” rather than “cricketer”, by the ignorant assertion that in South Africa all black people were called “coloured” and by countless other inaccuracies and solecisms. To some extent this is a shame because to be fair there are some insights into KP’s character and background and the description of (for example) the struggle between Pietersen and Peter Moores is good. But the insults really should have been edited out. To say that Andrew Flintoff was once “…boozing his hefty Lancashire contract up the walls of Preston’s public houses” is crass and Ian Botham’s lawyers might be interested in Veysey’s allegation that Beefy got “fat and complacent in the second half of his career”. The best thing in the book is Clive Rice’s thoughtful foreword but Rice’s assertion, that Pietersen “knew full well that in South Africa he wouldn’t be given a chance because of the stupid quota system” is as ignorant as it is offensive. KP would surely have made it in South Africa despite the quotas, just as fellow-whites AB De Villiers, Johan Botha, Albie and Morne Morkel, Roel Van der Merwe, Dale Steyn, Paul Harris and others have recently made it. This key aspect of Pietersen’s life demands more balanced and sensitive treatment than it gets in this pot-boiler. Cricket historians might like to suggest when was the last time that the result of any Test match, let alone an Ashes Test match, could be predicted with absolute certainty after the first day. The bookmakers have Australia at 12/1 on and England at 9/1 against and that is about right. With the weather set fair there is no doubt that Australia will win the Headingley Test - I'll go further and say that they will win comfortably within three days. If you have tickets for Monday or Tuesday make other plans now! Sport is played in the head far more than it is with the ball or the bat or the racquet or the club. From the first ball today (Strauss palpably lbw although not given out) it was clear that the Aussie heads were clear and their minds fully focused. England didn’t really seem as if they wanted to be there at all. They weren't not trying - absolutely not - in some respects they were trying too hard. But the essential connect between tactics, technique, temperament and self-belief was missing. Australia on the other hand had it in spades. They had a plan - bowl line and length and bat with confidence - and they executed it admirably. Ten decent cricketers and one great one combined into a formidable force- only one of the team (Watson) was not involved in at least one England wicket that fell. For England the sum of the parts of eleven decent cricketers managed, not for the first time, to be far less than what their individual talents should have delivered. And so for England, at Headingley anyway, the game is up. Perhaps the writing was on the wall before the start with all the curfuffle over the fire alarm at their hotel and Prior's injury. With backroom staff to cover every requisite - in numbers that far exceed the number of players - wouldn't it have been ironic if there had been an unfulfilled need for a reserve wicket-keeper? Keepers can get injured just before play begins you know - it happened in the last Test match! But really none of this would have mattered had England's batsmen "relaxed and enjoyed themselves". The clichés always say that no matter how big the occasion sportsmen should "play their natural game" and "go out and express themselves". England looked like they'd been invited to a party where the refreshment was grapefruit juice and there were going to be readings from Proust and music by Birtwistle. Over much of this Ashes series Australia has played the better cricket. 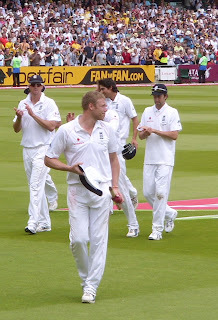 England won well at Lord's, inspired by Flintoff, but Australia was far from humiliated. At Headingley there has been no inspiration at all from an England side who look demoralised and dead in the water. Factor in a motivated and determined Australian team inspiringly led, from the front, by a Ricky Ponting who clearly wanted to answer the drunken, booing rabble in the stands in the best way possible. By performance. Well done Aussie. 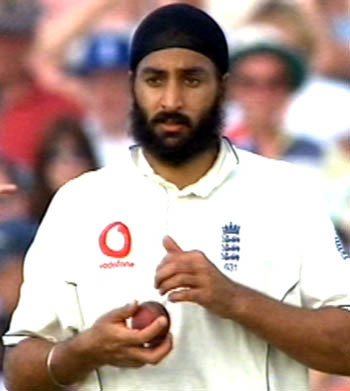 "Leadership" which gave us the chaos of the England captaincy. "Governance" which gave us Stanford. "Enthusing participation" which gave us international cricket thrown off free to air TV. An England team which fails - or at best flatters to deceive. As we know the ECB is a self-perpetuating oligarchy absolutely impervious to change - other than changes which in some way "benefit" those that vote at its top table meetings - basically the eighteen county chairmen. It is this reality which explains most of the damaging decisions, from Stanford to the Sky TV deal, of recent years. And it is the only explanation why, post Stanford, Giles Clarke and David Collier held on to their jobs despite the clamour from most of the thinking world of England cricket supporters for them to go. The ECB's decision-making frequently defies logic and is the antithesis of good governance. And just when you thought that it might be safe to go back in the water the shark that is the ECB decides to turn viciously on one of its own - their landlord at Lord's the Marylebone Cricket Club (MCC). Now the perception of the MCC is like that of the ECB some distance from the reality. MCC is seen as being a fusty institution populated by ageing old buffers and clinging on to the relic that once they were the most powerful force in world cricket by far. The elitism, the long waiting list, the red and yellow ties and (much worse) blazers seem to communicate that the brand of the club is struggling to get into the twentieth century - let alone the twenty-first. There is some truth in the charge that the MCC is clinging on to its past. The fact that the "Laws of cricket" are still nominally the province of a British private members club is a silly anachronism. Similarly the MCC's pompous claim to be the guardian of the "Spirit of Cricket" is neo-colonial and arrogant - as well as arrant nonsense. The fact that the MCC spends hundreds of thousands of pounds of its members money on its absurd and self-appointed "World Cricket Committee" - a talking shop and dining club for senior ex players like Tony Lewis, Geoff Boycott, Rahul Dravid, Alec Stewart, Steve Waugh and Mike Gatting - is a ludicrous hangover from the days when MCC really did run world cricket. But ignore for a moment all this hubris. What the MCC does supremely well is run the finest cricket ground in the world. in Mumbai and Cape Town's marvellous Newlands amongst them. But it is not national pride that convinces me that, home or away, there is nowhere to touch Lord's. At home Lord's is by far the biggest ground and by far the best equipped with the best drainage and ground care systems. It has the best seating (a lot under cover) the best catering and the best sight lines for spectators. It has a world class museum, an excellent shop - and so on. And architecturally it is beyond criticism - the Media Centre, the Mound Stand and the Grandstand are fine and, in sports stadia, unequalled examples of modern architecture - and the wonderful and well-persevered Victorian pavilion is a gem. And note I haven't even mentioned the heritage and the history. Over the years I have with pleasure taken guests to Lord's for Test matches - guests from India, New Zealand, Australia and the West Indies all of whom have loved every minute of the experience. The place is full of history - but it is a modern ground par excellence as well. The MCC is rightfully proud of the achievement that is Lord's. But, as ever, the club is not standing still and detailed plans exist to take the capacity up from 29,000 to nearly 40,000 - double the capacity of any other British cricket ground and nearly treble that of some. Whatever you may feel about the hubris of the MCC nobody can surely deny that Lord's is England's finest venue by far for cricket - nobody, that is, except the apparatchiks of the ECB who clearly don't believe this - or if they do have other agendas to pursue. 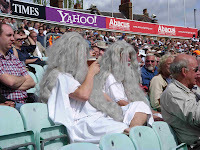 In 2012 Lord's has no Test match for the first time in living memory. 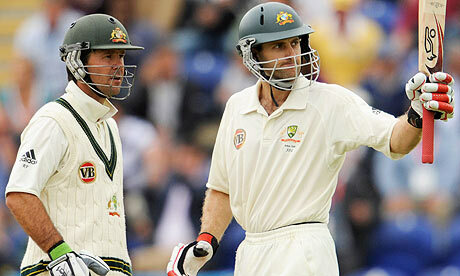 In 2013 there is a Test match against New Zealand in the run up to The Ashes but (would you believe it?) no Ashes Test match at Lord's (the Queen will have to go to Durham). And so it goes on. 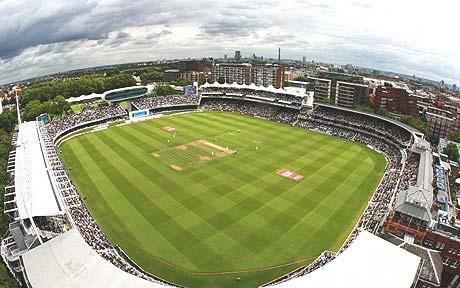 Whilst The Oval is guaranteed a Test match every year for the foreseeable future no such guarantee exists for Lord's. This means that the MCC's development plans for the ground will have to be put on hold - any chance that we might get a ground in England offering Australian style ground spectator capacity (perhaps at low Australian level ticket prices) is effectively abandoned. True MCC might still get a Test match in 2012 and an Ashes match in 2013 - but only if they put together a sufficiently attractive financial bid. The "home of cricket" may get egg all over its face if other grounds, maybe backed as Cardiff was in 2009 by funny money from some local government slush fund or by the immense personal wealth of a high roller like Rod Bransgrove at Hampshire who would love to bankroll an Ashes match at the Rose Bowl - and to hell with Lord's. In trying to understand the ECB we always have to ask the question Why? - and the answer is usually the same. Because the County Chairmen perceive that a particular course of action is in their interests. Vote for Giles Clarke - done! Vote to reject a sensible proposal for a nine-team franchise Twenty20 tournament in favour of the inane eighteen county status quo - done! And so on. So the ECB's facile commitment to take Test cricket around Britain will get the nod - even if it means we have Test matches at Cardiff rather than Trent Bridge and now Durham rather than Lord's. Logical - of course not. Corrupt - I couldn't possibly comment, but you may think so!